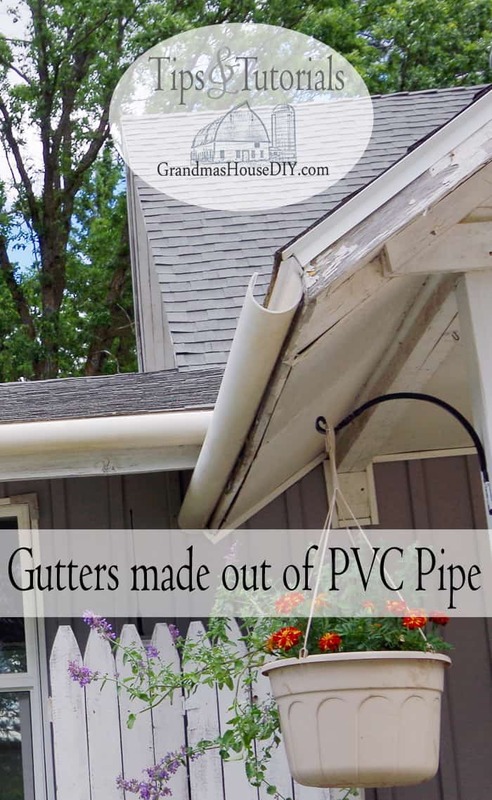 This is a post on how I created gutters for my house using PVC pipe! 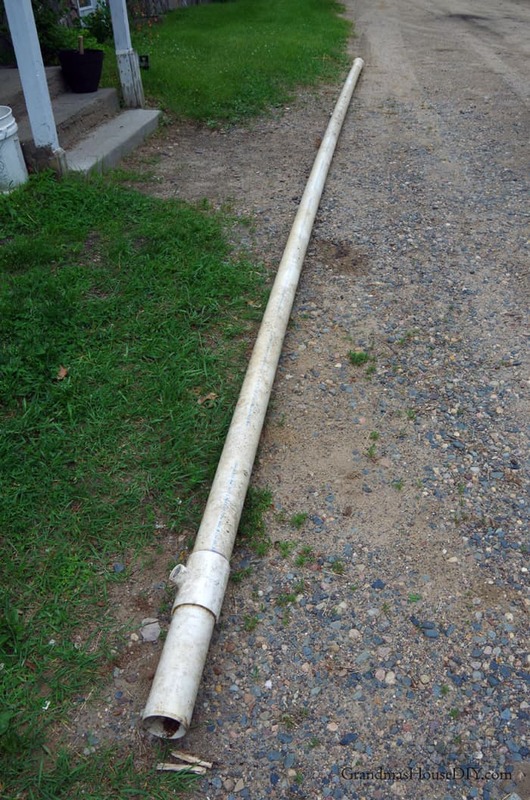 So, quite awhile ago, I stumbled on to the coolest thing online: Rain gutters made out of 3″ PVC pipe. Since then I cannot find it online ANYWHERE! The only thing I can find online about it is forums of people like me who want to try it and other people telling them to just hire a crew to put up seamless gutters because apparently: we’re all rich. Not that I wouldn’t love to be able to afford seamless gutters! See, this 100 year old farm house has never had a gutter on it and has never had a water issue. However my poor little flower garden in the front of my house absolutely gets hammered. 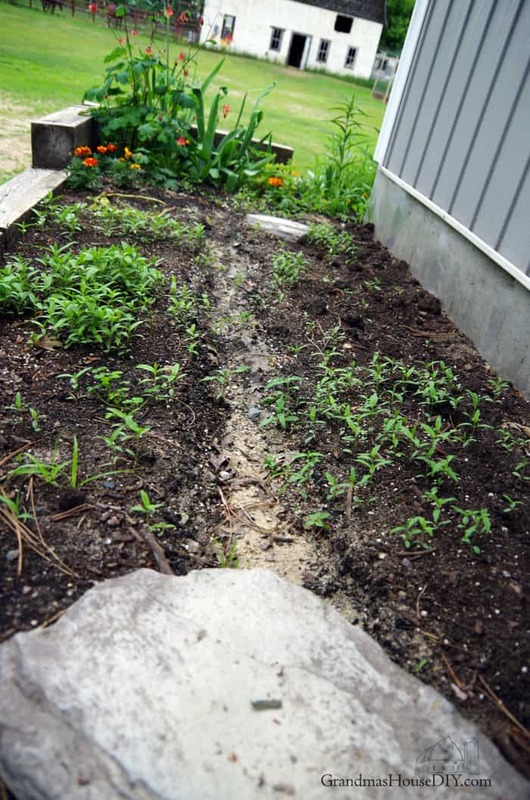 The summer rains create a trench right down the middle of it and, not to mention, all along the front of my house my hydrangea bush and various other plants get similarly beat up. 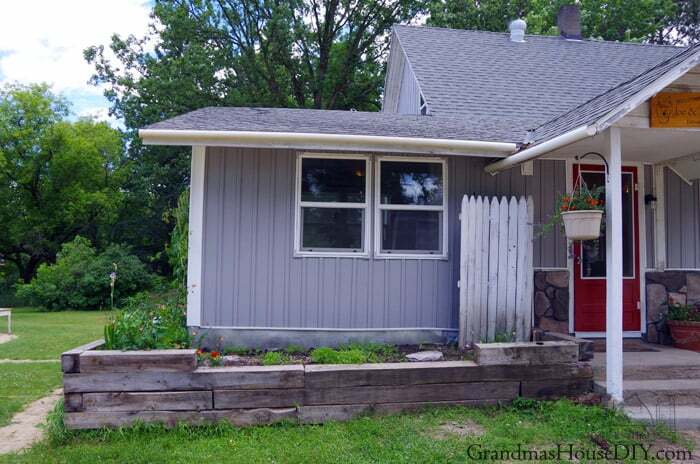 I decided we would start above my flower garden and, eventually, do the rest of the front of the house too. The next dilemma was figuring out how to hang/attach it to the eve. 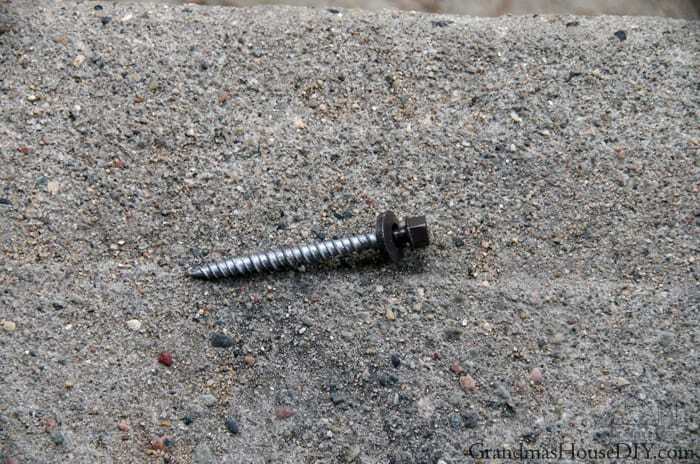 (My eves are only covered by little 1x4s so they wouldn’t be strong enough to hold it so I would need to make certain I hit the ends of the roof joists with whatever screws I used.) I did some looking at pipe hangers etc. because not only have I seen them in hardware stores I’ve also used them but I didn’t find anything I thought would work and also look ok. PVC pipe is very strong so I just put steel screws inside through the back of it. Initially I was going to just cut the completely in half so one pipe would make two gutters but the more I thought about it the more I wanted a “deeper” gutter then that. I ended up cutting off about 1/3rd of the pipe using a table saw. With the portion above my garden done I can say that this was a brilliant idea that someone had and I would totally endorse it. I got the pipe cut and hung in less then an hour and BOOM: the problem in my flower bed is only a memory. We had a serious rain storm here just the next day after I got them up and I watched proudly as a plan actually worked like it was supposed to. I hung the pipe so it slanted toward the porch then drained down into the second pipe that slanted toward my driveway. I’m pleasantly surprised by how nice they look because with no hangers, no parts, no joints etc. they are totally seamless and no one in my family has even noticed that they’re up lol because without looking right at them they’re entirely unnoticeable and I totally love that! Plastic pipe gets brittle in the sun? Why yes, yes it does, just like ALL plastic including the plastic gutters that you can buy in the store. Because these have literally no other parts I’m confident these will out last any other plastic gutter out there though I don’t know if they could compete side by side with steel in survival time because, seriously, steel is hard to compete with. 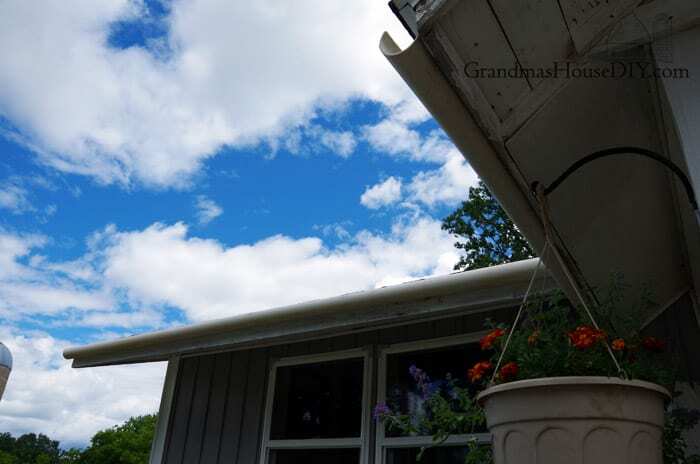 One length of 8 foot PVC pipe is around $8 the equivalent gutter in aluminum is $7, the equivalent gutter in vinyl is $4 and the equivalent gutter in steel is $12 and none of that includes the hangers etc that you need for any type of premade gutter to actually attach it to your house. So, do I think I would do this again as opposed to buying actual gutters if I had to actually go out and buy the PVC pipe? YES. I really love how well these work, how they look and how easy it was to do. What a clever trick! 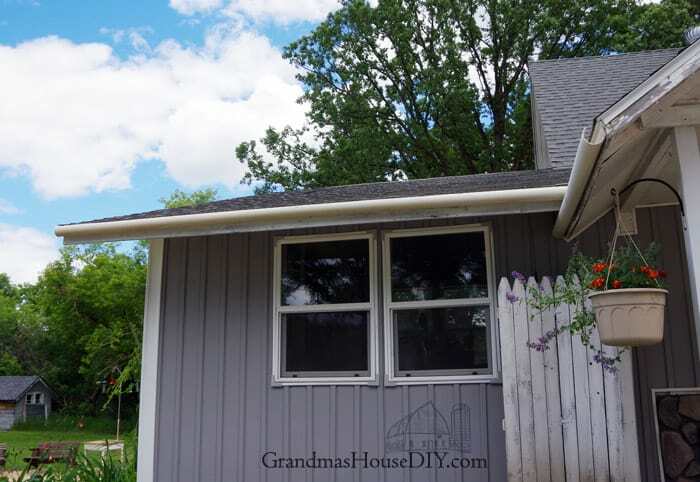 We’re required to have downspouts, which would make this project much more difficult, but this is a great option for sheds or smaller structures that might not need full gutters. Thanks so much for sharing at the #happynowlinkup! Great Angie! Thanks for coming by! I love the idea of using what you have… and not always doing it the “right” way! Thinking “outside the box” is great. 🙂 Thank you for sharing your project. 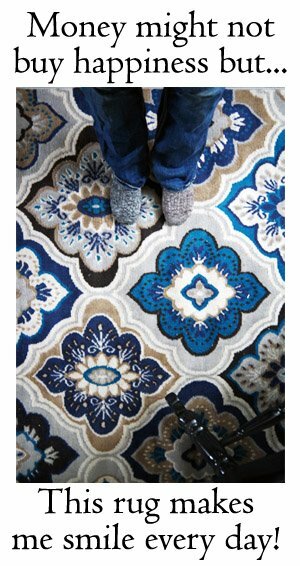 What a clever diy! Thanks for sharing it with SYC. Thanks Jann, have a great weekend! 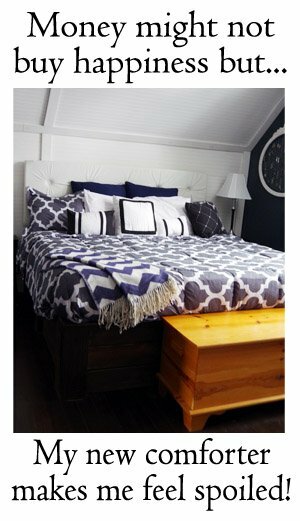 I’ve been looking for quick ideas for just above my front door and this would be perfect! Thank you so much for sharing. Awesome Trudy, have a great weekend! Great job! We have a friend that has the expensive gutters. They look terrible because the water is overflowing the gutters and leaving them very dirty. That’s an absolute genius idea! I’ve got a shed in my garden that this would be perfect for, even better as PVC pipe is rather cheap and I’ve found guttering to come at a premium. Aside the fun with the tablesaw and the pipe, did you have any other tricky bits? 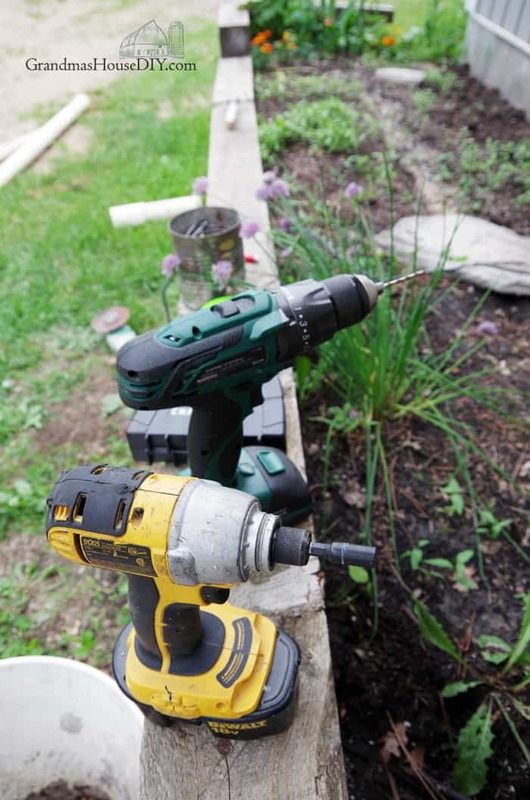 Hi Adam, no tricky bits besides making sure to have an extending on your screw driver, the head of it will be too big to get into the pipe so make sure you have at least a 3″ extender for your bit! Thanks for coming by! Hi Nancy, yup next on my list is to look into rain barrels actually! I was even thinking about putting a little one in the corner of the garden (moving the perennials as need be to make room for it) gosh that would make watering the garden so easy! What a great idea! Thanks for sharing your ideas at the Pleasures of the NW’s DIY party! I love your guttering it looks very professional. I would not be surprised if it works better than seamless guttering. Thank you so much, we’re really happy with it so far! Thanks for sharing at the Inspiration Spotlight party. Shared. See you again soon. Thanks Theresa for coming by! What a wonderful idea, Thank you for sharing, have a great weekend! Absolutely love this idea! Just bought a doublewide mobile home and plan on doing this! 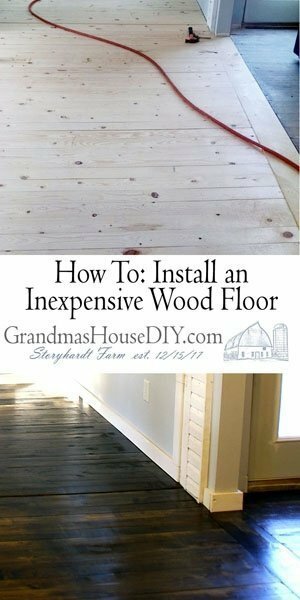 It will be perfect and mumu sturdier than the flimsy vinyl gutters you can buy. Been there done that. AZ can get some pretty heavy down pours and I think this will stand up much better. And for the down spouts can use drain tees as well as full cap at end where the run would end. All very doable!! Thank you for sharing this awesome idea! What a great idea Dory! I was planning on doing the same thing on one end (an elbow down) so I can connect it to a rain barrel someday! I am so glad I found this. It Is exactly what I need to do to my new single wide. I like trying to do projects that I mostly can manage myself and cost efficient. I was wondering though do you ever deal with leaves/debris getting caught in it? I was wondering if screwing/gluing/latching on some screening would be doable? I have to figure out where to screw it in since I dont have eves, so may be doing right into the siding trim near the roof. 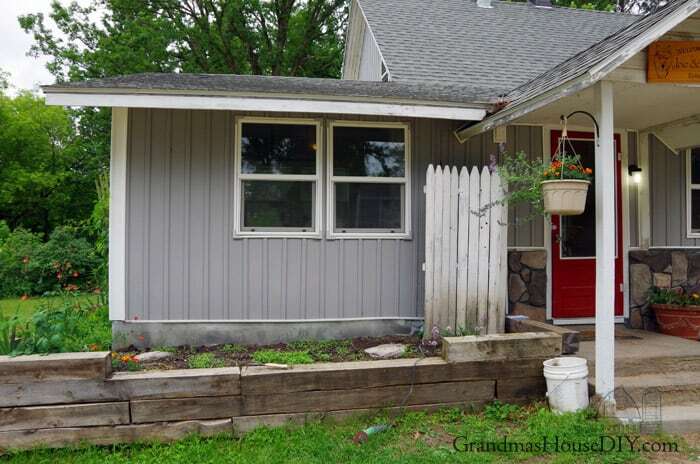 And I have added rain gutter to my future outside wish list. Thank you. Hi Wanda, this was such a great project that I am STILL really happy with how it worked out. I don’t have close leaf or pine trees near this part of the house so I haven’t had any problems with debris. They make something that’s like a foam that you can cut to size and put into your gutters that keeps the debris from going into them that might be an option for you. Any kind of screen over top should work too! Good luck! A downspout would be very simple to make as well just simply glue in two end caps and a 3″X3″X1.5″ tee to your 3″ pvc pipe. Then cut the top 1/3 to 1/2 of top of the pipe off. Install the gutter and run your 1.5″ downspout with 90 degree or 45 degree depending on your configuration. Hey Roy, that’s very true! And it would look just as nice and seamless as the rest of it!